At first glance, it would seem that positive thinking and Attention Deficit Disorder (ADD) have nothing to do with one another. But many of us with ADD develop negative thinking patterns because we become frustrated by our challenges and frequent feelings of being overwhelmed. This negative outlook then makes it even harder for us to manage those challenges and move forward. Practicing positive thinking allows people with ADD to focus on our strengths and accomplishments, which increases happiness and motivation. This, in turn, allows us to spend more time making progress, and less time feeling down and stuck. Stresses and challenges don't seem quite as bad when you are constantly reminding yourself of the things that are right in life. Taking just 60 seconds a day to stop and appreciate the good things will make a huge difference. A fear of not being liked or accepted sometimes leads us to assume that we know what others are thinking, but our fears are usually not reality. If you have a fear that a friend or family member's bad mood is due to something you did, or that your co-workers are secretly gossiping about you when you turn your back, speak up and ask them. Don't waste time worrying that you did something wrong unless you have proof that there is something to worry about. In his book "Change Your Brain, Change Your Life," Dr. Daniel Amen talks about "ANTs" - Automatic Negative Thoughts. These are the bad thoughts that are usually reactionary, like "Those people are laughing, they must be talking about me," or "The boss wants to see me? It must be bad!" When you notice these thoughts, realize that they are nothing more than ANTs and squash them! You don't have to be an expert to know the benefits of a good hug. Positive physical contact with friends, loved ones, and even pets, is an instant pick-me-up. One research study on this subject had a waitress touch some of her customers on the arm as she handed them their checks. She received higher tips from these customers than from the ones she didn't touch! If you find yourself ruminating, a great way to stop it is to interrupt the pattern and force yourself to do something completely different. Rumination is like hyper-focus on something negative. It's never productive, because it's not rational or solution-oriented, it's just excessive worry. Try changing your physical environment - go for a walk or sit outside. You could also call a friend, pick up a book, or turn on some music. When it comes to the corporate world, a protocol is pretty much the religion. To know the things needed to do are the basics of productivity, but interaction and having a steady mind makes up the entire thing to true productivity. There are those who seem to work well even under pressure, but they're uncommon ones and we are human and imperfect. To get these little things like stress under our skins won't solve our problems. Sometimes it takes a bit of courage to admit that we're turning to be workaholics than tell ourselves that we're not doing our best. 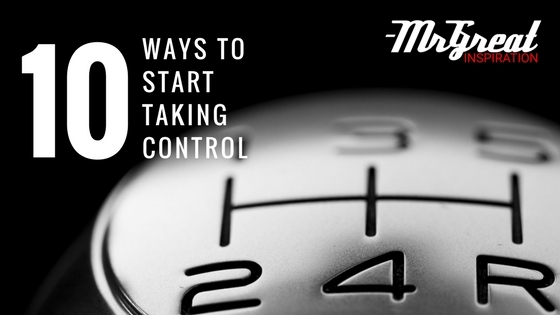 We hope guys you find our article "10 Ways To Start Taking Control" by Mr Great Inspiration useful.